Lawmakers in Arizona gave their approval in a senate committee Wednesday to a bill signaling strong opposition to a possible November ballot initiative that would mandate 50 percent of the state's energy production come from renewable sources by 2030. 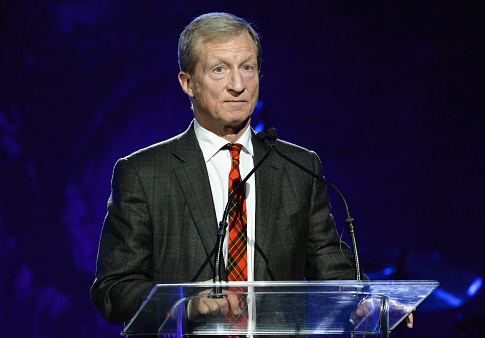 Tom Steyer, the former California hedge fund billionaire turned political activist who is also running commercials nationwide urging an impeachment of President Trump, is one of the potential initiative's biggest proponents. The bill would not directly override the ballot measure if it is passed by voters, but "would spell out that any violation of the constitutional provision would be only a civil violation," according to the Arizona Capitol Times. Additionally, the bill set a maximum one-time fine on energy companies who might be out of compliance at $5,000. "It sends a strong and an unmistakable message to those out-of-state people that want to come in," Republican state representative Vince Leach told the senate committee. "We just tell them: ‘Arizona's constitution is not for sale.'" Steyer's group, Clean Energy for a Healthy Arizona (CEHA), needs to submit roughly 226,000 valid signatures by July 5 to get the renewable energy proposal on the November ballot. Republican lawmakers scorched the Steyer-led push. "I do reject California billionaires buying their way into #Arizona and dictating policies that will raise utility rates on families in my district," State Sen. Kate Brophy McGee tweeted. Other lawmakers expressed concerns that the ballot question would not count nuclear energy in the renewable percentage, because Arizona is home to the largest nuclear power plant in the nation. A representative for CEHA could not be reached, but the group tweeted on Wednesday, "#azleg is voting soon on an illegal scheme to ignore the constitution and voter-approved standards for renewable energy. RETWEET to tell your legislator that in Arizona, clean energy and the constitution matter! REJECT #HB2005"
Representatives from NextGen America, Steyer's political PAC that works on many of his energy-related efforts, also did not return a request for comment. While Steyer's efforts to move the U.S. House of Representatives majority back into Democratic control have been noted, the billionaire's local efforts—particularly in Western states—are well-positioned to advance this year, thanks to the ballot initiative process in these states, as well as open governor's races in places like Colorado and Nevada.